M.2 SSD drives - compatibility, overheating, encryption problems - PC Buyer Beware! To benefit fully from NVMe M.2 SSD drives, you must be able to boot the operating system, usually Windows 10, from it. That requires UEFI BIOS support. Most standard BIOSes (the type in use before UEFI BIOSe), do not support booting from NVMe and won’t ever be updated to do so. Therefore, you won’t be able to use an M.2 SSD drive unless it has UEFI BIOS support even if you use a PCIe adapter card to host the drive on a system that uses an old standard BIOS. 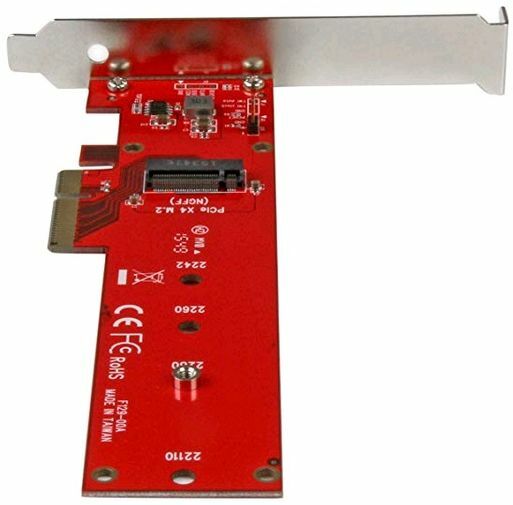 The image below shows a StarTech.com M.2 Adapter – x4 PCIe 3.0 NVMe – Low Profile and Full Profile – £25 in Jan. 2019. It can host drives from lengths 2242 to 22110. Click on the image to view its full size. Any motherboard with an M.2 slot will provide UEFI BIOS support. With Windows 10 installed, the system supports M.2 SSD drives fully. An M.2 SSD drive is keyed in the same way as RAM memory is so that it can only fit into the socket if the key on the drive matches the key on the socket. An M.2 SSD has one of three key types: B, M or B+M, but an M.2 socket can only have one key. The M.2 SSD drive shown above has a B+M key – two notches. You can only install it if the socket matches those two notches. The M.2 standard requires that SSDs (or, other types: WiFi, Bluetooth, etc.) have chips only on the upward-facing side. Therefore, the drives with the largest capacities have to be longer in order to accommodate more flash memory chips. At present there are five lengths of M.2 drive, but not every desktop or laptop motherboard can accommodate all of them. The 2280 drives – an example is the drive shown at the top of this page – are the most common length. Therefore, you have to find out if your computer can accommodate a particular length before making a purchase. For more detailed, illustrated information on key and length compatibility, visit the site linked to below. WD stands for Western Digital. WD, Seagate and Toshiba ate the three major computer drive-storage manufacturers. “I bought the 500GB WD Green drive for a budget Intel Coffee Lake processor I was putting together and the option of not having extra cables for power and data appealed to me. Very easy to install and it looked really good on the motherboard. Unfortunately, I bought the drive without doing any research. When buying components, you must do your research. After a few benchmark tests, I noticed the system was slower than several other M.2 drives. So, I looked up its specs. On paper, it is a lot slower than other drives on the market. I found out that the WD Green M.2 drives are power-saving devices. It saves power by the most efficient use of it circuits by doing everything slower. It’s the WD Black drives that are designed for the highest performance. “Monitor your drive’s available capacity, operating temperatures, SMART attributes and more with the WD SSD Dashboard.” Acronis True Image comes with the drive so that you can transfer a system image of your old drive to the new one or clone it to the new drive. If Acronis gives you problems, use the free Macrium Reflect. Question: Is this drive compatible with HP Zbook 15 G2 laptop? Accelerated by Micron 3D NAND technology. 2. – Integrated power loss immunity preserves all your saved work if the power unexpectedly gets cut. 3. – AES 256-bit hardware-based encryption keeps data safe and secure from hackers and thieves. 4. – Crucial 5 years limited warranty. “I have since found other reviews on other sites noting the same issues experienced by my 2 drives. The 2 star review reflects the positives of price and read/write performance and the huge negative regarding temperatures. Given that the M.2 form-factor was designed for confined spaces it is difficult to recommend these drives. Even in my case, blessed with free space and airflow it is a challenge to keep these drives at a suitable temperature. “Anyway, just to get this out of the way for hardware encryption, I have wasted my money over the years as it has come to light that both Samsung and Crucial SSDs have flaws in the hardware encryption that allows it to be bypassed, so don’t use it. Web-search for “Samsung SSD hardware encryption”. Samsung have even advised to use software encryption, which means that they are struggling to implement a fix with firmware upgrades to its hardware encryption. ← Upgrade Win7 PC to Win10 or build or buy a new one?